Streets of Just For Laughs. 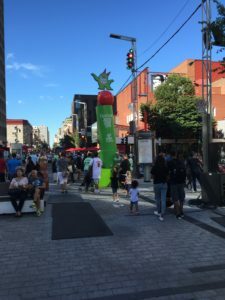 We were in the beautiful Canadian city of Montreal for 3 days for Canada’s Heritage Day long weekend (July 30 to August 1st) and it was a glorious, action-packed three days. Tons of events happen in Montreal, and this weekend in question let us enjoy two major festivals — Just For Laughs Montreal, the world’s biggest comedy festival — and Osheaga, a gigantic music festival. We did JFL on Saturday (essentially the last major day of the half-month festival) and saw four shows, and then Osheaga on Sunday (the last day of the 3-day festival). Then day 3 was a day to relax. I doubt it’s possible to do more in a quick three-day visit! Day 1: Just For Laughs – you have a lot of options with JFL’s Montreal festival. It’s a huge festival with tons to do. JFL itself has some of the bigger name acts (JFL passes available let you save money and are the bees knees), while the associated Zoofest/Off-JFL has lesser-known but still stellar acts. We capitalized with the Zoofest pass, $50 for 3 shows (normally $20-$25 each) plus a free one each day (we only did the 3 shows due to our schedule). $50 each let us experience “Sunday Surprise”, with guest host Blake Griffin, NBA superstar and hilarious comedian – who knew? He was followed by stunningly funny Ronny Chieng (from the Daily Show fame). The rest of the comics were decent, except Hannibal Buress (who we’ve seen before and I was extremely surprised to see, but came on the stage so drunk and/or high that he couldn’t leave the stage soon enough — but wouldn’t. I don’t go to work drunk and discombobulated, so neither should this dude.) We saw two other shows as well with our Zoofest pass (“Hosts With The Most”, and “Work the Crowd With Todd Barry”, Barry being a funny guy who worked off the cuff to do nothing but interact with the crowd for an hour. We also saw Aziz Ansari and the crew from Master of None (one of my favorite shows) doing a cast talk (no autographs or photos afterward, as I had hoped!) ($30 each). Massive crowd @ Osheaga. It got much bigger as the day went on! Day 2: Osheaga. Attracting over 130,000 people over 3 days, Osheaga is like Canada’s Coachella or Lollapaloooza. Big names, small acts, arts, and tons of genres, make for a good time. A 1-day pass cost us $115 each and we felt we got a great experience just seeing one day, with a varied musical lineup. We liked some of the extra-curricular activities between stages, like some good poutine – we had a majestic Sicilian Poutine right after watching rapper Tory Lanez crowd-surf (while barely rapping). P.S. 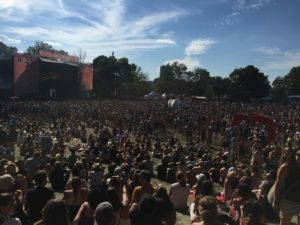 : Avoid the poutine from the Osheaga generic food tents–the “pulled pork” tasted like it came from a can, and cost way more than the more authentic stuff across the festival. My girl Boo got a nice turtle temp tattoo from Parks Canada. Comfy seating everywere (though always packed). Bring a blanket or something! (We got a sick fold-up travel mat from the dollar store for $3.) The major downside for me was the beer – only mass-produced tasteless crap from festival sponsor Molson brought down the experience for me (paying almost $9 for a can of crap beer or $7 for a glass of watered down, extra-carbonated Molson Canadian kept me from getting too buzzed and having a real good time. How about some real beer next year??!) Some of the artists seen: Radiohead, Keys N Krates, British rapper Skepta, Canadian singer Allie X (who stayed around afterward for autographs and photos with fans), Scandinavian singer MØ (awesome singer, awkward dancer), and singer BØRNS. A great time for a couple who barely attends these things. 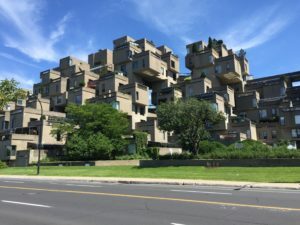 Habitat 67, Montreal, on the bike ride to Parc Jean-Drapeau. subway from Parc Jean-Drapeau (home of Osheaga), and Old Montreal. 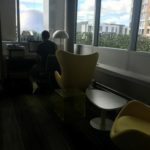 We stayed at Hotel Zero-1, a nice, modern spot with nice views onto downtown, a fitness center, great staff, a tapas restaurant, and an outdoor terrace. It’s right across from the 747 bus from downtown, right near several subway stations, and right across from Chinatown. Keep in mind if planning a trip to book early, as prices rise fast. Another option: Hotel Des Spectacles was a very cheap, comfortable place to stay for sub-$120 when we went a few years ago and booked early. Getting around: all-you-can travel transit pass including the otherwise-expensive 747 airport bus is just $18 for 3 days. Bixi bikes, again, $5 for all-you-can-bike (with trips <30 min. ).